It was a national public holiday in Malaysia yesterday. A friend who just gotten married last month invited us over to her house for a small gathering. At the mean time, over at I Heart Cooking Clubs, it's Pot Luck week and we can choose to cook anything from these chefs: Diana Henry, Nigella Lawson, Mark Bittman, Giada de Laurentiis, Jamie Oliver, Tessa Kiros, Rick Bayless, Madjur Jaffrey, Yotam Ottolenghi, Donna Hay, and Nigel Slater. And so, I chose to bake Nigella Lawson's famous (and fail-proof!) 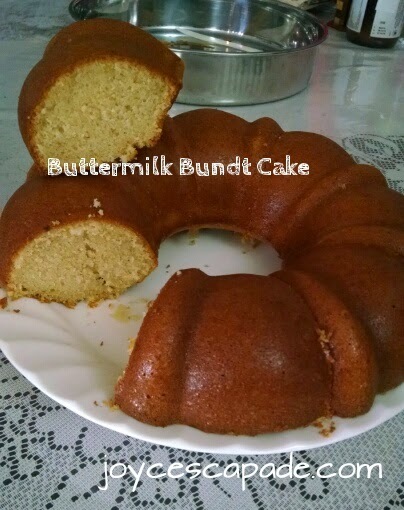 Buttermilk Birthday Cake (I baked it in a Bundt pan, so I named it Buttermilk Bundt Cake) to bring over. Recipe from Nigella's "How To Be A Domestic Goddess" cookbook or here. 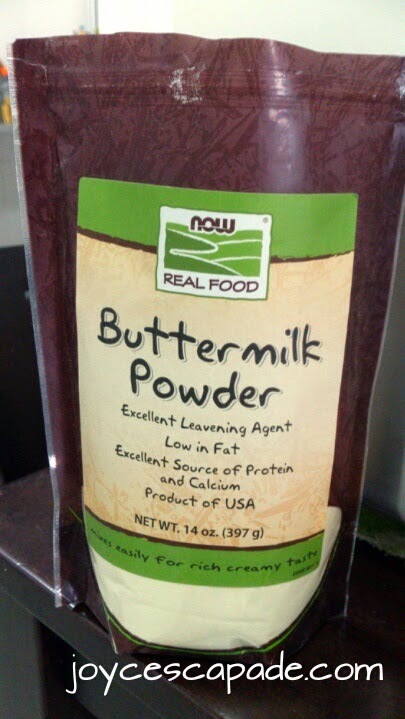 * If you don't have off-the-shelf buttermilk, you can substitute with 1/3 cup plain yogurt mixed with 1/2 cup low-fat milk. Let it sit for 10-15 minutes before using. 1. Preheat oven to 180°C. Lightly grease a 23-cm ring mold cake pan. 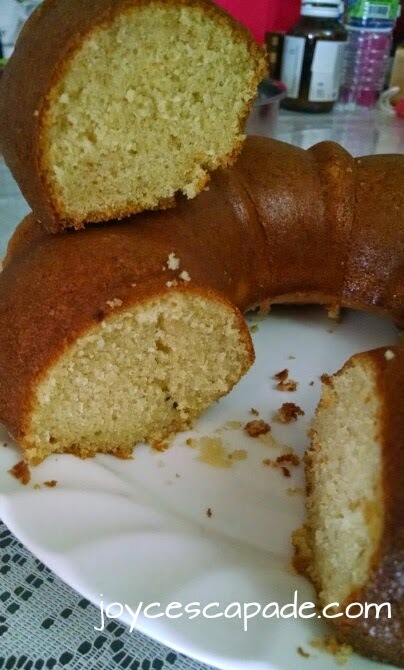 Note: I used a 10-cup Bundt pan, so I also sprinkle some flour after greasing it. By the way, the 10-cup Bundt pan is a bit too big. I've yet to find out which size will be more suitable. 2. Sift flour, baking powder, and salt together in a bowl and set aside. 3. Pour buttermilk into a measuring cup and stir in vanilla extract. 4. Cream the butter and sugar in a large bowl with an electric mixer at medium speed until light and fluffy. 5. Reduce speed and add eggs one at a time, beating for 30 seconds between additions. 6. Add alternating increments of the flour mixture and the vanilla-buttermilk, blending well after each addition; this should take 3 to 5 minutes. 7. Pour batter into the prepared pan and bake for 40 minutes (30 minutes if using layer cake pans) until the cake is beginning to shrink away from the sides and a cake tester comes out clean. If using a mold with a lot of patterning, leave to cool for 20 minutes. 8. Loosen the sides of the cake with a round-bladed knife and turn out onto a wire rack to cool completely. My hubby said, "Look, a giant doughnut!" LOL! Thanks Nigella! Even my non-cake-eating-hubby said the taste is really good! Yay! 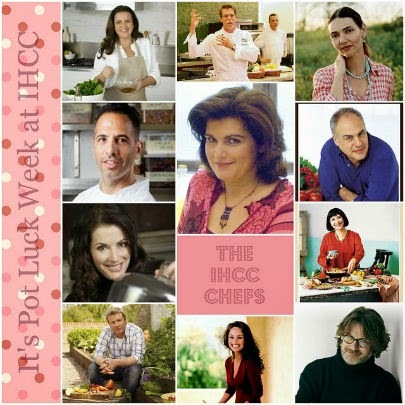 I'm linking this post with I Heart Cooking Clubs (IHCC) for this week's theme, October Pot Luck! 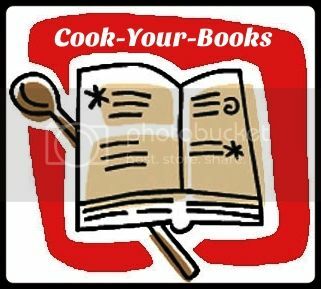 I'm also submitting this post to Cook-Your-Books #17 hosted by Joyce of Kitchen Flavours. Thanks Joyce! I had way too many slices. Haha. That IS a lovely cake, isn't it? I have made it a few times for my little church's coffee hour. It's always gone at the end of the fellowship hour! Great choice for this week! That cake looks incredibly moist and sounds delicious, perfect for sharing with friends. Yeah, my friends enjoyed it. 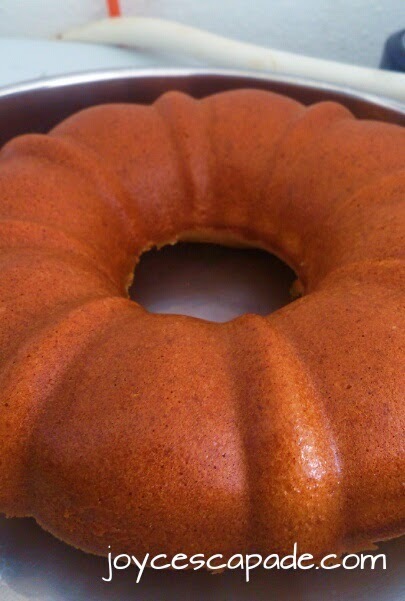 I bet that is such a gloriously moist cake - lovely choice, and the bundt pan really makes it look so pretty and special. At first I was disheartened when he said that after helping me to turn the cake out of the pan. Then I took a look, and I was like, yeah, it did look like a giant doughnut. Haha! What a lovely cake out of a lovely tin.